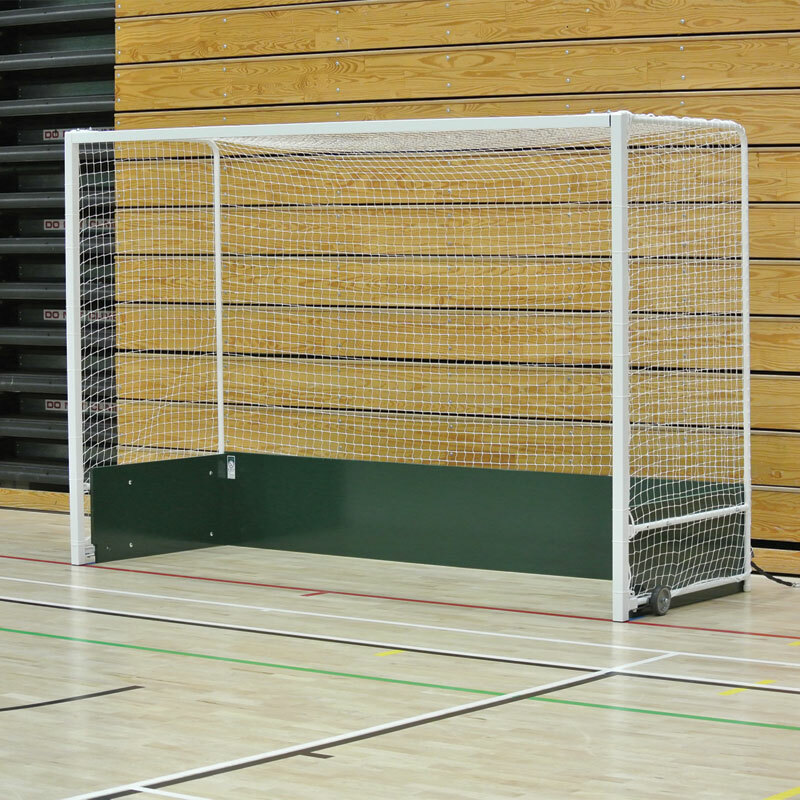 Available with either regulation or practice backboards the Harrod Sport ® Indoor Steel Folding Wheelaway Hockey Goals have been developed so they can be quickly and easily folded and wheeled away to storage or just to be moved on another indoor pitch. 2 x Steel Folding Wheelaway Hockey Goals. 1 x Pair of Goal Nets. Folding and wheelaway steel posts. 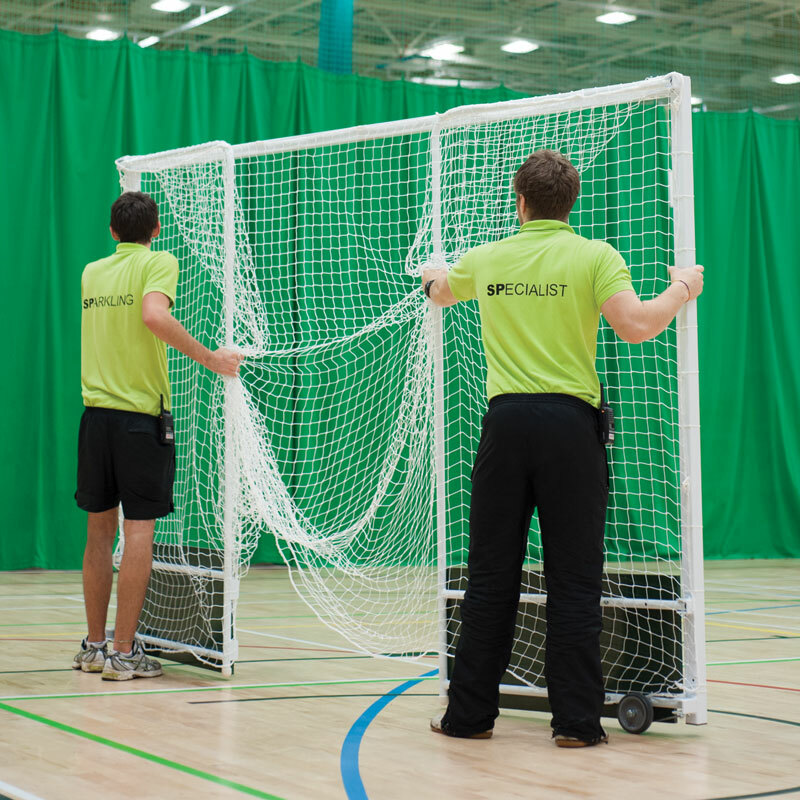 Crossbars and uprights are made from 50mm square steel and supplied with synthetic net hooks. Comes complete with 28.6mm net supports and rubber tyred non marking wheels which automatically retract when the back tubes are folded and non-marking floor pads. Regulation Backboards height is 460mm. Practise Backboard height is 152mm. Complete with Regulation Backboards. Harrod Sport code HOC-026. 460mm x 18mm thick green backboards. Total weight 150kg per pair of Goals with Regulation Backboards. Complete with Practice Backboards. Harrod Sport code HOC-018. 152mm x 18mm thick white backboards. Total weight 90kg per pair of Goals with Practice Backboards. 3.00m x 2.00m x 1.00m (10` x 7` x 3`). Lost the instructions for your Harrod Sport ® Indoor Steel Folding Wheelaway Hockey Goals? Please Click Here to download a new copy.